Republican candidate Mike Huckabee kicked off a two-day tour of Iowa this afternoon, about 24 hours after officially entering the 2016 presidential race. Huckabee won Iowa’s 2008 Caucuses and, while many polls showed him a leading contender in 2012, he decided not to run. Today, Huckabee said the 2016 Iowa Caucuses are not a make or break prospect for his second try at the White House. Huckabee’s first stop today was in the south central Iowa city of Oskaloosa where he toured Clow Valve Company and focused on his call for Americans to acquire the education, training and skills to earn a “maximum wage” rather than settle for a minimum wage job. The company makes fire hydrants and other products for water utilities. 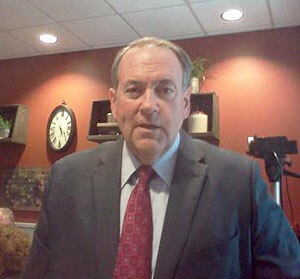 Huckabee will hold a rally tonight at Living History Farms in Urbandale. Tomorrow he will make stops in Cedar Rapids and Sioux City.